If you already own a timeshare property, you may be well aware that the costs associated with this arrangement far outweigh the benefits. That’s why so many folks are in the process of trying to cancel timeshare properties. Unfortunately, they often find out that getting out of a timeshare contract is nowhere near as easy as opting into one. Those who claim the opposite are in the business of scamming hardworking families like yours. These individuals will take advantage of your situation by making outlandish claims and then making off with your money (and worst of all, you’ll still be stuck with the timeshare!). How do you avoid becoming the victim of a timeshare scam when you’re trying to cancel timeshares? Check out the signs below. You know the saying — if it sounds too good to be true, it probably is. That’s definitely applicable for those who want to cancel timeshare properties. Scammers will make all sorts of guarantees they can’t possibly make good on. For example, they might claim to be “overwhelmed” with the sheer number of buyers they have lined up for your property or that they can sell your timeshare far above market value. Keep in mind that the average price of a new timeshare is $20,040 and that timeshare resales are priced far below that. When someone says they can get you a lot more, know that these claims simply aren’t true and are meant to convince you to hand over some cold, hard cash. Don’t fall for these slick sales tactics. Beware of the ringing phone. If there’s someone on the other end who claims they can sell your timeshare right away but that you need them to do it, hang up. As a general rule, no legitimate company will call you out of the blue to talk about selling your timeshare for you. Though you may be tempted to hear out their pitch if you’re in a bind, it’s better to walk away before they convince you to give out any proprietary information. And if you do receive one of these calls, report it to the Federal Trade Commission (FTC). This is considered to be the oldest trick in the book — and the biggest red flag there is. Here’s what happens: someone offers to sell your timeshare for you but claims they’ll need you to pay some kind of fee upfront (for the cost of the listing or for taxes on the property, for instance). You pay this money believing that this person is working to sell your property. That individual pockets the money and disappears without a trace. Legitimate real estate agents will never require fees upfront; they make their commission only when the sale of your property goes through. This is a good tip to keep in mind when dealing with any kind of company. Organizations and individuals should be more than willing to provide you with vital information you need to discern whether they’re legit or not. If someone who contacts you is hesitant to provide you with information in any way or evades your questions, do not engage any further. In other words, if they won’t provide you with a physical address or they keep changing the subject when you ask for additional info, walk away. In the digital age, there’s a good amount that can be gleaned from the internet. Conduct some research on your own into this company’s website and see what you can find out. Unsecured website forms are a big clue that something’s amiss. If there’s no “s” after the “http” in the URL on pages that contain fields wherein personal information is entered, that’s a sign this website is not reputable. Google whatever contact information you can find on their website and look them up via the Better Business Bureau and their state’s department of corporations. Don’t fall for these resale scams. 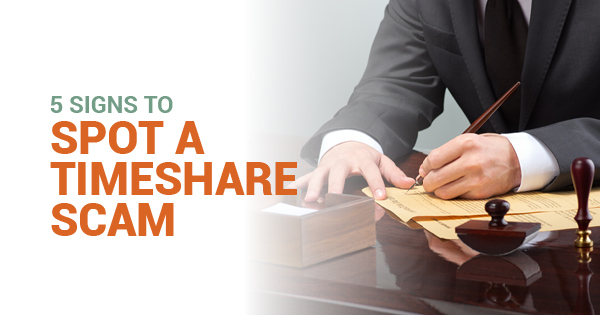 Those who want to cancel timeshare properties need assistance from legitimate resources. Our timeshare cancellation attorneys are here to help. For more information, contact our offices today.